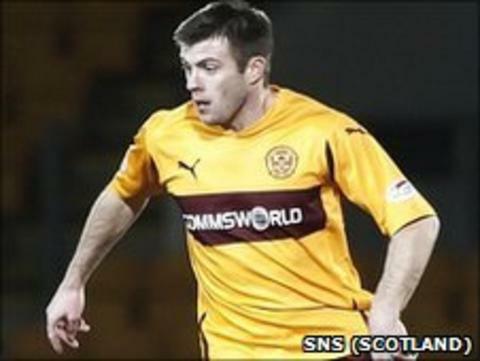 Midfielder Steve Jennings has signed a new one-year contract at Motherwell. The former Tranmere Rovers player, 26, made 40 appearances for the Steelmen last season, scoring one goal. "I am delighted to be staying at Motherwell. It's a fantastic place to play your football," Jennings told the Motherwell website. "I've thoroughly enjoyed my time working under Stuart McCall and he's one of the main reasons why I wanted to stay here." Aberdeen offered Jennings a two-year deal but his preference was to remain in Lanarkshire on a shorter contract. "The whole thing dragged on a little longer than it should have," he added. "I should've signed a few weeks ago but I've had a wee bit of a fall-out with my agent and that held things up slightly. "But I am glad it's all sorted now and I concentrate on playing football again. "I really think we've got a real chance of doing even better than last season and I want to be a part of that." Manager McCall earlier in the week persuaded captain Stephen Craigan to sign a one-year extension and on Friday completed the capture of midfielder Nicky Law from Rotherham on a one-year deal. McCall says the club have received no offers for striker Jamie Murphy or goalkeeper Darren Randolph. Murphy and Randolph helped Motherwell make the top six in the Scottish Premier League last season, but McCall is happy there have been no concrete offers for either player. "Maybe it's because when people are ringing I'm telling them it's £10m and they don't come back," joked the manager. "Obviously, from a manager's point of view I don't want to be losing anyone. There's other ones that have been on the radar of clubs but as we speak hopefully between now and the start of the season nobody will leave. "And we're confident with the squad that we've got that we can put on a good show next season. "In the first team squad we've only lost John Sutton and brought in Michael Higdon. "Although in quantity we maybe don't have the biggest squad, in quality I'm very happy with it." In addition to their top-six league finish, Motherwell also made it to the League Cup semi-final and the Scottish Cup final in the last campaign. McCall is looking to keep the standards at least as high again this season. He said: "To improve on last season will take a lot of doing, but we have to look to finish in the top six. "I want to see us playing the sort of football we did in spells last year. We have to be better defensively. "You look to entertain, you want to get people through the turnstiles but you want to be successful as well. "In a nice world it would be attractive, successful, attacking football, but we're very positive and we just hope to improve on last season."